Work kept me up very late, so I slept rather late today. It was great to get seven hours of sleep, though my body is telling me that I could use a great deal more. Lunch was a light meal--a small baguette with ham and Gruyere--at Mrs. London's Bakery & Cafe, an inviting little shop along the main street of Saratoga Springs. I then spent time with friends and browsing the art show and the dealers' room. For dinner I joined a big crowd of folks related to my publisher for a short walk to Jacob & Anthony's, where we enjoyed a meal of classic steak-house fare. The table was too big and too full for me to be able to talk to most of the people at it, but the little conversational groups along its length seemed to be having a good time; ours certainly was. At the art reception I settled on the art I wanted and bid on and won a piece. I'm quite pleased with it. After that, I chatted with friends in lounge areas and in the bars until I noticed it was after one, and I really wanted to work and then crash. I worked a lot again today, but because I can't say anything about what I'm doing, I'm going to stop mentioning it for the rest of this trip. Lunch took a group of us to the Putnam Market, where the crowds were hard to take but the food was very good. Afterward, we enjoyed a light dessert at Saratoga Gelato. The gelato there wasn't up to what I enjoyed in Italy, but it was still quite good. My second and final panel of the con was about politics, economics, and power dynamics in fantasy realms. We talked about many aspects of these issues, and once again the audience seemed fully engaged. I next roamed the art show and the dealers' room for a while. I could get in so much trouble in both of them. This art show is strong, and I very much enjoyed getting to see so many wonderful original works. World Fantasy Cons have a tradition of a mass signing, which normally occurs, as it did here, on Friday night. 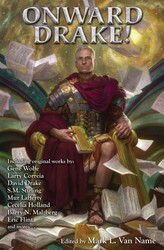 Largely because each con-goer received a copy of the special WFC edition of Onward, Drake! in her/his book bag, I spent more than an hour straight signing books, a nice change from my usual lonely time at the signing tables. Several of us then headed across the street to Forno Bistro for a late Italian dinner that was good, if not exceptional. As at other World Fantasy Cons, the bar here was hopping with folks talking, and I joined that crowd and chatted with friends. I expected to dislike Saratoga Springs, but so far I've quite enjoyed my time here. It's a nifty little town, with a fun main street and plenty of good restaurants. I'm very happy to have been wrong about it. My day went primarily to work, lunch, and more work until my 3:00 panel rolled around. Lunch took a small group of us to Compton's, a little diner that appears to have no Web site. The food was exactly what one would expect walking up to the place, so I had a completely reasonable breakfast for lunch. On the way to my panel, I browsed the dealers' room for a bit. It was, like most such rooms at World Fantasy Cons, full of books, which made it very entertaining and very tempting for me. My panel today was titled, "Real World Nomenclature, Taboos, and Cultural Meaning." We talked about the choices writers make when they create fantasy worlds and when they write historical fantasies. The discussion stayed interesting and the fairly large audience remained engaged for the full hour, so I had a good time doing it. I then took a spin through the art show, which proved to be very good. I want many pieces in it; time will tell if I decide to spring for any of them. I spent the next couple of hours working before heading to dinner with a different group of friends. Our meal at 15 Church was tasty, and everyone left both full and satisfied. My company is closing tomorrow at noon for a few hours to go to see Spectre, the new James Bond movie. (We've done the same thing for each of the three previous Daniel Craig Bond films.) Because I am here and could not go with everyone else, I instead went to see the film tonight. I will talk more about it after the con, but I will say that I very much enjoyed it. Work took me until late in the night, so now it's time to rest a bit before another day of work and con stuff. I woke up early, showered, and headed to the airport for a day with a lot of travel in it. The first flight deposited us in Philadelphia in time for lunch. 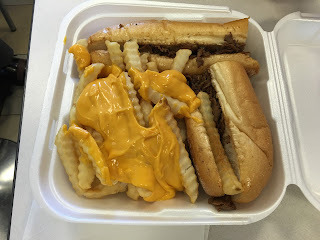 If you go to a one-short-order-cook cheesesteak shop at the Philly airport and order (to share, of course) a cheesesteak and cheese fries, you get this beast. Provolone on the sandwich, the whiz on the fries; it's the complete Philly cheese experience. It's also a heart attack in Styrofoam--and tasty, too. After a very small Red Mango treat, we boarded a plane for Albany. A car rental and a half-hour drive later, and we reached our destination: Saratoga Springs, New York, home of this year's World Fantasy Convention. I registered, checked into the hotel, and settled down to catch up on the work I had not finished on the planes. I worked a bunch for multiple hours and then joined friends for a very tasty Spanish dinner at Boca Bistro. We shared multiple small plates, and all of them were quite good. I'm generally for helping writers in trouble, and I have a go-to recipe for certain situations, so I spent a few minutes writing and submitting a short contribution. 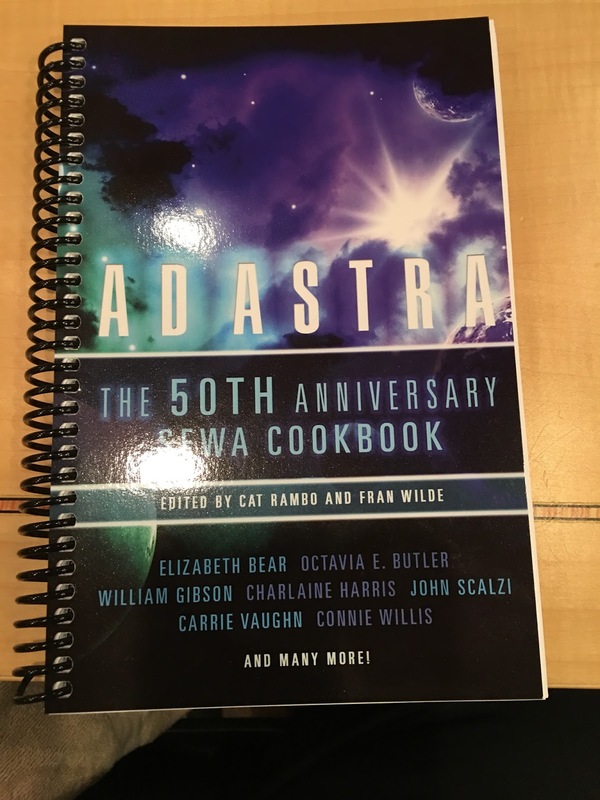 The book, Ad Astra: The 50th Anniversary SFWA Cookbook, is now available. You can order it directly from SFWA here and make sure all the money goes to the Legal Fund, or you can buy it at various online booksellers. Click the image to see a larger version. Sorry about the glare. My recipe is titled, "The Meaty Mess." I've prepared it many times, always with great success. It's fairly quick, definitely easy, and something almost any carnivore will enjoy. It is not at all vegetarian. You'll have to buy the book to learn just how to cook The Meaty Mess yourself. Want to learn more about Onward, Drake!? Want to listen to me yak about the book--and about Dave? Want to hear other authors, including David Afsharirad, Tony Daniel, Hank Davis, and Eric Flint do the same? I thought you did, and now you can, courtesy of the Baen Free Radio Hour podcast. A group of us were guests on the show a little while ago, and our episode premiered on October 30. You can listen to it or even download it here. Friday morning, I awoke before eight a.m. to begin what I thought would be the usual trip home from Austin. I turned on the TV and selected my usual channel (NBC, because I hate the sound of The Today Show, so having it on encourages me to hurry). A weatherman was speaking loudly and urgently. "Repeat, we have a confirmed tornado sighting and flash flooding all around the greater Austin area." These are not words you want to hear first thing in the morning. The good news was that the tornado had touched down well south of Austin. The bad news was that it was moving north. I considered going right back to bed, but if the storm faded and flights were on time, I would have lost a ticket we'd already purchased. So, I showered, checked out, and walked into the rain to load the rental car. Just that short time in the rain left me damp, but the rainfall was still mild, so I was heartened. Off we went to the airport. What followed was about 45 minutes of some of the most harrowing rain driving I've ever done. I took the most direct route--the toll road, which features an 80-mph speed limit--and hoped for the best. I started out able to sustain 70, but by the end the rain was a thick gray wall so dense I was barely able to hold 35. Giant trucks going 80 slalomed by me, their drivers apparently willing to risk it all to reach their destinations sooner. Sections of different lanes proved to be flooded with a foot or more of standing water. My rental's lights were no match for the falling water, so I couldn't see more than a few car lengths ahead. We did ultimately reach the airport safely, for which I was very grateful. After getting soaked walking from the rental car facility into the terminal, we stood in a long line, got our boarding passes, and headed through security. We'd left early enough that we still were 45 minutes from departure time. That time, however, no longer mattered, because the flight had slipped from 10:45 a.m. to noon. No problem. When stuck in AUS, do the sensible thing: Have Salt Lick lunch and some ice cream from Amy's. We did, and both were delicious. From there, we headed to the Admirals Club, where I learned they had delayed the flight again. No problem; I can work in an Admirals Club. I settled into a chair just in time to hear the announcement that American had canceled our flight. I then commenced a ritual that dominated the next many hours: Queue up. Wait in a slow line. Get a new flight and new boarding passes. Settle down to work. Hear the next cancellation announcement. At this point, the Admirals Club team delivered the news that prospects for anyone's departure had turned grim. It seems, as best I could gather, that the tornado's path had changed so that it was headed toward the airport's tower. They consequently and sensibly evacuated the tower. The tower then flooded, so that by the time the tornado was no longer a tornado and no longer headed for the tower, no one could get into the tower. Then the ramps to the runways flooded. At this point, the Admirals Club folks announced that the airport would be closed for departures until at least three o'clock. At least I then got some work done. Sometime after three, they canceled my last flight, I did the queue/wait dance, and I learned that I was not going home that day. Instead, I was on an eight a.m. flight the next day. I'd been coordinating with Gina back in the office, so she got us rooms in a great downtown hotel (the Westin) and a rental car. We collected our luggage, walked to the rental car center, and learned we had no car yet. No people were on staff to help, because, as we later learned, most of their staff had called to say they would not be able to make it to work. We found a young man who was in his fourteenth hour of work but who was still running hard and being extraordinarily pleasant. He got us a car, the confirming email hit my phone, and off to the car--which was, of course, on the far side of the facility--we went. I had just opened the car's trunk when a wild-eyed man ran at me, waving a contract, screaming, "That's my car!" I also had an email contract for the car, but he looked crazier than I felt, so I told him by all means to take the car. He immediately calmed and was polite and grateful. The same young man who had helped us before happened to witness this exchange, so he pulled a car from a line, drove it over to us, and then arranged for the contract to be waiting by the time we reached the exit. That dude deserves a bonus. I wish I'd caught his name, but his badge had blown off. At the checkout line, the guy helping us said, "I just clean the cars. I don't know how to use this thing, so this'll take a while. Me and this other guy are the only ones here." The tablet rebooted. Our helper ran to the other person on duty--the omnipresent helpful young man--and learned how to log on and to check us out. We exited the airport, drove through a far milder but still annoying rain, and eventually reached the Westin. I settled down to work not quite nine hours after I'd left my previous hotel room. Sometimes, you just don't get to leave town.